As if the Nokia Lumia 610 NFC announcement was going to be Nokia’s one and only announcement today at WIMA 2012, the Nokia BH-310 NFC headset was also launched today. The BF-310 NFC Bluetooth headset is designed with the frequent car traveler in mind. The headset boasts fast charging times, long standby time, and a complete in car calling set. As you can see in the image above, the headset is designed to fit into a charging dock which then connects to the car charger, which can also be used to charge your Windows Phone. On top of all that, the headset itself features two microphones and Digital Signal Processing, this brings superior noise suppression and echo cancellation. 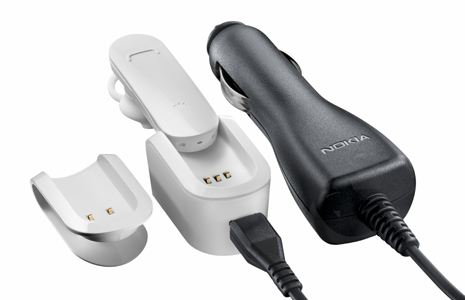 Nokia’s “Always Ready” feature also enables users to answer calls by simply picking up the headset from the holder, and end the call by putting it back. With the launch of the Nokia BH-310 NFC headset, it has become part of the Nokia NFC accessory lineup along with the Nokia Play 360°, Nokia BH-221, Nokia Essence, and Nokia Luna. The BH-310 product page still doesn’t seem to list a price, but keep a close eye on that page if you want to purchase one. The headset will certainly look great with any Nokia Windows Phone, especially the newly announced Lumia 610 NFC.